In March 2010, the European Higher Education Area was officially launched, proclaiming the culmination of a ten-year timeframe projected at Bologna in 1999, when the education ministers of 29 European states signed a declaration that would fundamentally influence the future of their higher education systems. Forty-seven countries, including all EU Member States and other countries as far afield as Kazakhstan, now take part in the so-called ‘Bologna Process’. Remarkably, this vast enterprise, which has led to rapid and sweeping changes in almost all higher education systems in Europe, has taken place outside the framework of the European Union and the Council of Europe. In fact, as this important legal analysis shows, it appears that with the Bologna Process the Member States have tried to sidestep the EU’s growing influence on higher education. teachers and the free movement of workers. 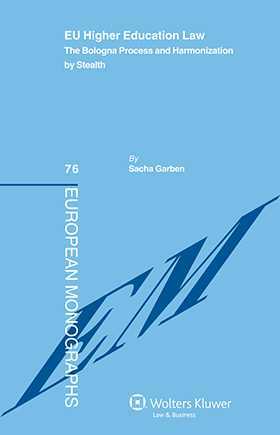 The author describes how the scope of the Bologna Process was significantly broadened during a series of meetings during the decade, analyses the relevance of the case law of the European Court of Justice and provides a detailed description of the adoption of the process into the national laws of France, Germany and the United Kingdom. A concluding normative assessment scrutinizes the process on the basis of democracy, transparency and accountability. Chapter 5 The EU, the Council of Europe and the Bologna Process: Common Objectives?